I slept outside a few nights ago. Lying a platform of packed snow, my face looking upward from the sleeping bag, I squinted at the Big Dipper. Within a few minutes, what appeared to be a moving star slanted across the dipper. Then another. And another. About 10 of them streaked through the Alaska flag in an hour. Those unblinking, moving lights were man-made satellites, or perhaps the empty rocket parts that sent them into Earth’s orbit, a few hundred miles overhead. Twenty years ago, I was surprised to see one satellite during a night of star-gazing. Even then, a space physicist named Dirk Lummerzheim said the sky was “crowded” with satellites. If it was crowded then, our planet now resembles your head bobbing down the trail during mosquito season. We are looped by thousands of intelligent devices and the defunct parts that got them up there. How many? Workers with a NASA group and the U.S. Strategic Command keep track of working satellites and space junk. They monitor more than 24,000 of these things, some the size of a baseball, others like floating UPS trucks. A bunch of these objects are military secrets. The other 19,000 now orbiting us in tight circles or long ellipses are not. You can see them on a site called Space Track. 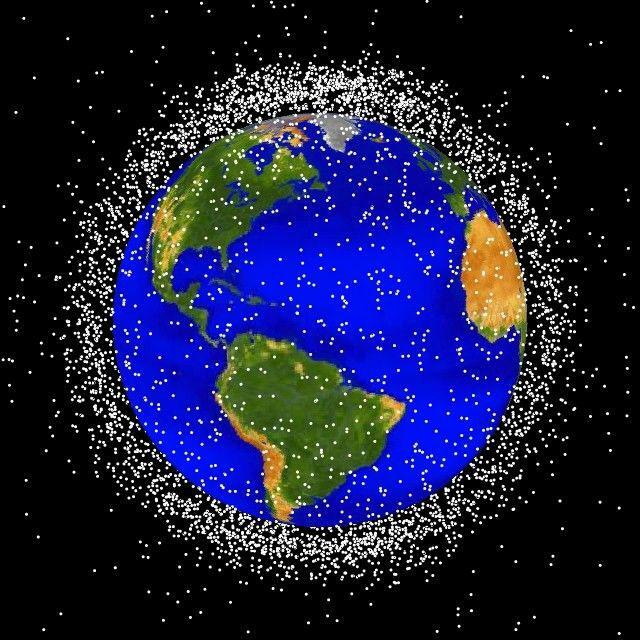 Right now, there are 1,578 working U.S. satellites, 694 U.S. rocket bodies and 3,990 pieces of U.S. space trash. The trackers are also following one satellite launched from Bermuda in 2016, and 6,500 working and non-functional objects blasted into orbit by Russians. The Russians started it all in 1957 when they launched Sputnik, which looked like a 200-pound beach ball with three spikey antennae. For years, scientists at the Geophysical Institute at UAF claimed they were the first Americans to see Sputnik. But space physicist and inventor of this column Neil Davis later corrected this claim. He revealed that his neighbor Dexter Stegemeyer had seen Sputnik’s rocket booster streaking through the sky while on his way to his outhouse on that October morning in 1957. Davis later installed a plaque on the outhouse for its significance at the beginning of the space age. Stegemeyer saw Sputnik’s rocket booster and we see satellites in the night sky because they reflect sunlight. They disappear when a satellite’s orbit takes it behind Earth’s shadow. Some weather and other Earth-observing satellites fly about 300 miles above us. A crowd of “geosynchronous” satellites are parked above the equator 22,240 miles above us, in the perfect place to stay in sync with Earth’s 24-hour rotation. Satellites used to monitor space weather orbit 186,000 miles above our heads. Earth’s natural satellite, the moon, is about 240,000 miles away. Two forces enable satellites to remain in orbit: the centrifugal punch that blasted it into space and Earth’s gravitational pull. Scientists calculate how much thrust is needed to insert a satellite at a given height. Unless it crashes into space debris, a satellite could circle Earth for millions of years. Most satellites have a lifespan of five or 10 years. About 70 percent of the satellites up there now were launched since 2010. When satellites stop working, it’s the operator’s duty, if possible, to steer them with boosters into Earth’s thick atmosphere to burn them up, send them out to orbit the sun, or change their orbit to an altitude less populated with satellites. In the meantime, those smart — and dumb — objects will keep circling overhead, sending us pictures of Earth, improving our weather forecasts and helping Alaskans navigate rental cars out of urban airports. Interesting stuff. I remember as a youngster we would regularly see weather balloons floating by way up on high. Shooting stars are quite common and now and again we could spot a satellite sailing by at night in iowa.